This week when we arrived at school we had a 8 new team members. This was very exciting for everyone. Nakita and Mrs G brought in some Tadpoles that had been caught on the farm where they live. 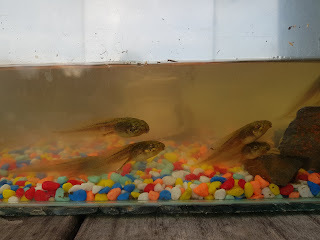 A number of them already had legs (so are known as froglets. One was almost a frog when it arrived. When they arrived we had to find some rocks in our school grounds that could be used in the tank. 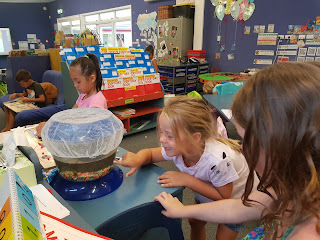 We then washed this carefully before adding the tadpoles (and froglets) to the tank. We came up with some awesome inquiry questions to research about frogs, where they come from, how they hatch, what they eat, How much they weigh and many more. 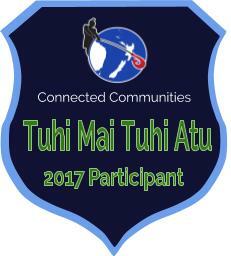 So watch this space for an update on what we learn. 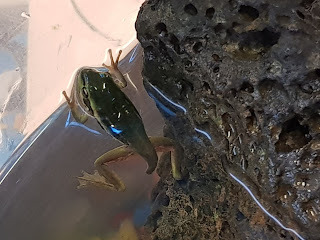 Later in the week we had one almost frog that loved jumping around, so just in case it tried to jump out we went searching for something to pop over our tank. We came back with a lovely hair net used when people are cooking at our school. This was perfect! After school Mrs G took it back to her house to release it back where it came from (as we have heaps more to watch). Mrs S has a tank that she is going to set up in Room 4 as well so there will me more opportunities for Team Maunga to learn and talk about frogs.